The ORPHEUS Radio app (photo: elephantcandy). The primary objective of ORPHEUS is to create a full object-based workflow, from the initial recording of the program to its reception by the listener. 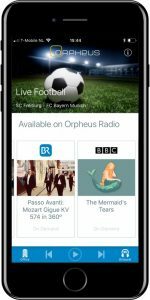 The ORPHEUS Radio iOS app was developed by elephantcandy to bring the benefits and innovations of object-based broadcasting to a larger audience and investigate the use of this new technology in many different situations and scenarios. Two studies were carried out to validate the usability and usefulness of the app in various configurations. Technically, the app is the first mobile application to use the MPEG-H next-generation audio codec, which supports audio objects, flexible rendering and streaming over MPEG-DASH. Among the many object-based audio features in the app are immersive audio formats including binaural and up to 7.1 Surround via HDMI, foreground / background balance to increase the intelligibility of speech, interactive 3D object positioning, selection from multiple languages and variable-length playback. The radio programs available in the app were mostly produced during the project and highlight various object-based features. The content includes radio documentaries, music and an interactive version of a live football match from BR, as well as radio dramas from the BBC. The ORPHEUS Radio app is still in pre-release stage. If you are interested in trying it out, please visit our iOS App page to receive a redeem code for the AppStore.